If you’re looking for a filmmaker who can accentuate the poetic nature of everyday life, you could definitely do worse than Jim Jarmusch. That’s kind of what his whole career is all about, even when he’s making movies about modern-day samurai or guys escaping from jail. This one is one of his more down-to-earth ventures though, following a regular guy with artistic aspirations through a week of his life. It’s a pretty low-event movie, one that seems to take place mostly in its main character’s head, and even its most dramatic moment featuring a struggle that’s almost entirely internal. And who better to play a guy of few (verbal) words but one that has a lot going on under the surface than Adam Driver, that most inscrutable (in a good way) of young actors. He plays the eponymous bus driver, who shares a name with his hometown of Paterson, New Jersey, and while he seems to just quietly go about his work and observe what is happening around him, we see him regularly write poetry in a notebook that he always carries with him, and we hear him read these poems in voiceover, often delivering them in a somewhat halting manner, as if he is still composing them. And that’s about all there is to the movie. 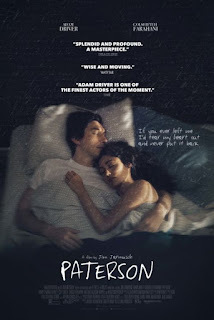 Paterson continues throughout his daily routine, working on his poetry and trying to take inspiration from his hero William Carlos Williams and his surroundings, although he seems to be struggling a bit. And that’s where the slow-moving, internal nature of the movie becomes fascinating. It seems that everyone around Paterson has some sort of artistic pursuit of their own, from his wife and her multiple creative outlets (including fashion, interior design, baking, and music), to a young girl he meets who is also a poet, to the bartender at his evening haunt, whose pursuit of his love of chess may end up causing him some trouble, to a cameo by Method Man as a rapper working on his verses while waiting for his clothes at the laundromat. Many of them also seem focused on fame, with the bartender highlighting famous Paterson natives on the wall behind the bar and his wife dreaming of becoming a country music star. And most of all, the spectre of Williams, who is certainly Paterson’s most famous son in Paterson-the-man’s eyes, stands out as the person whose example he’ll never live up to. But is that really the point? While Paterson’s wife pushes him to share his poetry with the world rather than hiding it in his “secret notebook,” isn’t art truly about expressing yourself creatively, no matter who is watching? 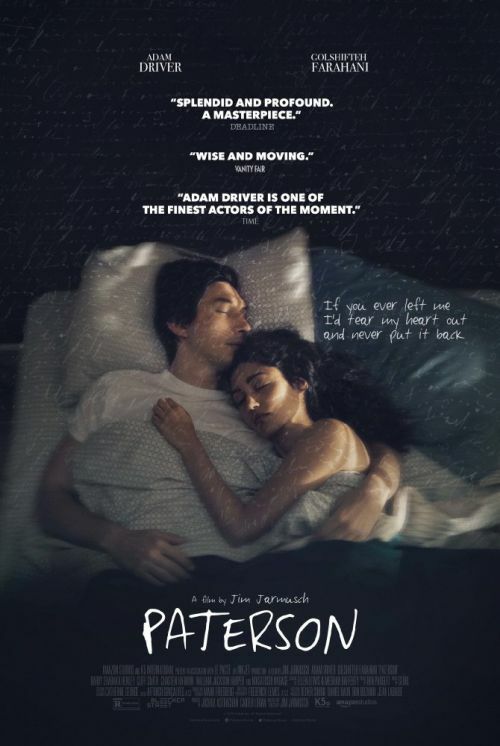 Or is Paterson’s intensely internal nature keeping him from sharing his poetry with anyone else, and he needs a push to get him to acknowledge to the world that he’s more than just a bus driver? Whatever the case, he definitely becomes forced to face himself and do something, and that’s where the movie attains a kind of sublime power, a call to action to not let your artistic gifts lie fallow. I’m especially fascinated by the film’s repeated use of twin imagery. Paterson encounters several sets of twins throughout his week, as well as other instances of doubling (two bus riders having a conversation in which they each relate an experience in which a pretty woman flirted with them, but nothing came of it; a pair of old ladies sporting similar attire and hairstyles; the bus dispatcher complaining about his personal troubles on multiple days, and so on). At first, this seems like a cryptic detail that highlights the poetry that Paterson sees in the world around him, but then it takes on relevance in relation to his wife’s urges to photocopy his poetry notebook. But after thinking about it, I feel like it’s the world telling Paterson that he is more than one thing; he contains multitudes. He can be a bus driver, and a loving husband, and a friendly guy at the local bar, and also a poet. It’s an empowering realization, and one that we can all take to heart.